40,000 BTU/Hr, Heats up to 1,750 - 2000 Sq. Ft. Functions as a free-standing STOVE 40,000 BTU/Hr. We have limited supply of this ECONO SAVER STOVE has several features including MULTIFUEL operation. It has a 40,000 BTU/Hr heating output, 50 lb Hopper Bin, AUTO-IGNITION, a LARGE Ash Drawer. It will burn Corn, Wood Pellets, any kind of bio-mass Fuel. Our high quality construction results in a five (5) year warranty, most other manufacturers provide 3. Load up our 50 lb hopper bin and burn up to 40,000 BTU/Hr to heat up to 1750 - 2000 Sq. Ft. Add-on Options exist for GOLD or Brushed Nickel Doors and Grills, plus Legs are an add-on option. Another option is thermostatic control and we sell thermostats digital or dial operated. Note a POWER OUTAGE Module is available. The manufacturer's recommended retail selling price MRSP is $2,075. 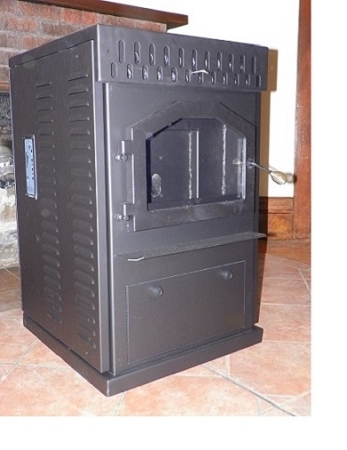 This is a HIGH QUALITY well-built stove and it is very unusual high quality for such a reasonable price. It is still wise to buy one and get it installed and in place this winter so you don't miss any remaining cold winter months ahead. This listing is for a Matte Black Door. OPTIONS are: (1) For GOLD or Brushed Nickel Door, add $250. It will burn corn. (2) GOLD or BN Front (Side) Grill $100, Top Grill $75, (3) Legs $150, (4) Front Gold Legs-2 $200, (5) Total of Four-4 Gold Legs $375. (6) We also sell a straight-out-the-wall and up-three-feet Flue Exhaust Kit for $365. (7) Chimney Flue Exhaust Kit 25 foot flex pipe is $545. (8) We recommend a Fresh Air Kit for $145. (9) Corn Screener/Cleaner, (10) POWER OUTAGE Backup Module is $179. (11) Hot Ash Vac is $249. (12) Digital Thermostat is $68, Dial-indicator is $35. (13) Remote Control Thermostat $245. (14) FANS Air Circulators Doorway and/or Room to Room $40 - $65. You must have AUTO-Ignite to use this feature. It is possible to either run this Stove with either a Thermostat or without one. The switch at the top of the digital display has either AUTO Mode, HIGH/LOW Mode (or T STAT Mode), or Manual Mode. In AUTO Mode, the thermostat does not call for heat, it will turn-off the heating feature of the insert(stove) and stop feeding pellets. When the thermostat calls for heat, it will turn-on the electric igniter and start feeding pellets. In HIGH/LOW Mode, if the thermostat does not call for heat, it will drop to a pre-set LOW (probably 1) setting that was factory pre-set. When the thermostat calls for heat, it will pop back up to it's original HIGH operator setting. If you run in thermostatic mode, it is recommended you run in HIGH/LOW Mode, otherwise you may burn out your ignitor turning it on/off repeatedly. The thermostat hooks up to two terminals in the rear of the printed circut board. We sell either a Wall Digital (Round or Square), or a Wall Dial-Indicator Thermostat, or a Remote Thermostat. You can only burn wood pellets with a thermostat. A Power-Outage battery backup feature exists where you can have a 12 battery hooked up to the stove simultaneously with the AC 120 VAC power cord. When the power fails, it will automatically revert over to operating from the 12 volt battery. The 12 volt battery is connected to the stove by 18 gage stranded wire to two terminals located inside the lefthand panel. Red Wire for positive and Black Wire for negative, the red wire has an in-line 4 amp fuse. Note when the stove is in the 12 volt battery backup mode, it will not auto-start and you have to light it manually. FIREPLACE INSERT: Econo Saver, 40 to 50,000 BTU/Hr., Wood Pellets, Multi-fuel Capability, heats up to 2000 Sq.Ft. FIREPLACE INSERT: High Technology CORN and WOOD PELLETS, 52,500 BTU/Hr., Mult-fuel Capability, 2500 Sq.Ft. This is a HIGH QUALITY unit with a FIVE (5) Year Warranty. Five Years is very unusual as most other manufacturers offer three (3). The FIVE YEAR WARRANTY covers the heat exchanger, frame housing, door, fire pot, auger. Electronics are also under one year warranty. Be careful what you buy and from whom you buy. Individuals and un-authorized dealers can not offer a valid warranty! We are a Dealer specializing in corn stoves and can help you through the installation as well as any on-going trouble shooting if necessary. Be careful as others may not have the capability to do that. Read our feedback. Customer may have it shipped by a commercial freight carrier 400 lbs to the nearest large-city Main Terminal serving the customer's geographic area. The customer will drive a pickup truck down to the Main Terminal and the Freight Company will load the unit into their pickup truck with a fork-lift truck. We estimate Freight to range between $175.00 to $275.00 and we will charge an average flat rate of $225.00 for the U.S. mainland. For another $50.00 we can ship direct to a local business in your town or nearby city that has a loading dock or fork-lift truck. Lumber Yards, Farm Equipment Dealers, and local Manufacturers are good candidates. Call for a quote to ship outside the U.S. such as Canada.